Academically oriented cosmetic surgeons enjoy speaking and lecturing. I have had the pleasure and honor to have been invited to lecture on six continents to every type of cosmetic surgery specialty. I generally average a trip each month although I have traveled over 20 weekends in a year, speaking nationally and internationally on cosmetic facial surgery. Probably every speaker that is in demand wishes, at some time, to be invited to speak at Harvard University. This is such a famous bastion of learning, speaking there was on my bucket list. That opportunity was fulfilled in April. 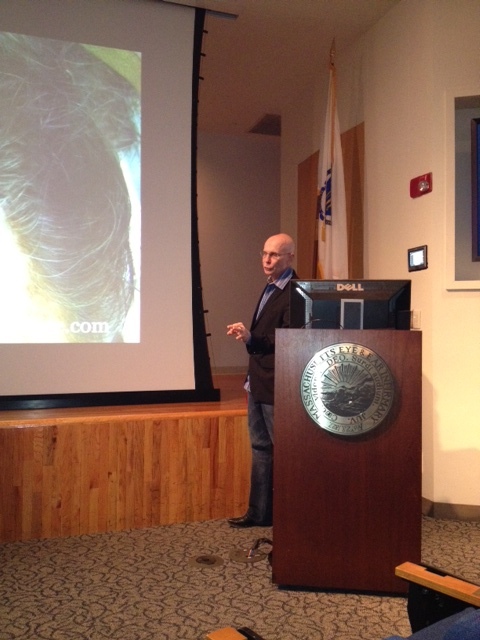 I was invited to lecture to the oculoplastics surgery department at Mass General Hospital by Suzanne Freitag, M.D. professor and director of the ophthalmic plastic surgery service. My lectures topics included surgical browlifting, facial implants and injectable facial fillers. Our day began with a tour of the facilities in Boston and a great dinner with the department faculty and residents that evening. It was a true honor to be asked to give these talks and an enjoyment to see and be around one of the most famous learning institutions in the world. Our hotel was at Copley Square and as we were leaving to go to the airport we could see the signs of the preparatioin for the Boston Marathon which was coming soon. Driving across Boyleston street where the permanent finish line resides was bustling with the usual daily activity and unaware of the carnage soon to come.